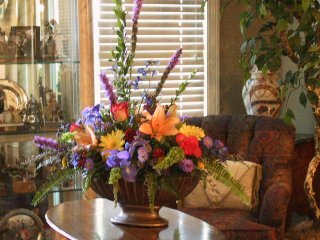 Lyncrafts & Floral Designs has been a leading, upscale florist and gift shoppe in the Riverdale area for over 18 years. 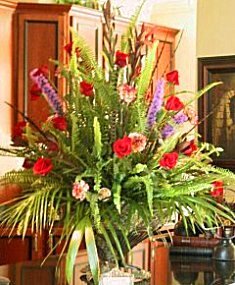 We continually strive to provide customers with personal, professional service and quality products, as well as distinctive floral, plant and gift presentations beyond their expectations. Welcome to our website - conveniently open 24 hours a day!! We hope you enjoy your online experience with secure, e-commerce ordering right at your fingertips. If desired, you may also call or fax orders to 973-838-6899, anytime - day or night. It is our pleasure to assist you with any local, as well as worldwide deliveries and remember that corporate accounts are always welcome. ** WE NOW OFFER HOLIDAY DECORATING! CALL FOR MORE INFORMATION AT 973-838-3673. Gifts for All Occasions ~ In addition to the eye-catching fresh arrangements in the store, you may also choose from a variety of decorative silk and dried arrangements, as well as custom fruit, gourmet and gift baskets for any occasion. Our extensive gift line includes assorted balloons, cuddly plush toys, collectible bears, clowns & dolls, ceramic pieces, picture frames, glassware, unique candles & potpourri, candy, greeting cards, gift bags & wraps, lots of seasonal items and much more! We encourage you to take advantage of our “Frequent Buyers’ Program,” “Reminder Gift Service,” and “Regular Cash-&-Carry Specials,” as well as the other bonus services we have available. Lyncrafts & Floral Designs invites to join our ever-growing family of satisfied customers!